Arbing, also called arbitrage is an odd term used by gamblers and matched bettors. In this simple guide, we’ll discuss what arbing is, how you can use it and we’ll share out top arbing tips to help you maximise your profit in 2018. What is arbing or arbitrage betting? Where better to start than a clear and concise arbing definition. Arbitrage is the process of buying and selling a commodity or asset simultaneously to take advantage of a difference in price. Arbitrage is a technique that is commonly used in the finance industry. Specifically in stocks and shares. However, we’re not interested in that application. In this article, we’re more interested in the betting side of arbitrage. Specifically, we’re talking about arbing which is a term coined by gamblers and matched bettors. Don’t worry, arbitrage and arbing mean exactly the same thing. Arbing in sports betting is a method used by individuals to guarantee themselves a profit by placing bets on all possible outcomes. By taking advantage of a price difference in odds, bettors can make a guaranteed profit regardless of the outcome of an event. Arbing is not gambling and there is no chance involved with this betting technique. The outcome is based on a mathematical equation rather than a prediction. Over the years, arbing betting has received a great deal of press from the betting industry. A few years back it was a surefire way to make a guaranteed profit from bookmakers’ differences in price. Whilst the number of arbing opportunities has decreased due to the development of technology, there are still times when you can make some great profit using this technique (more on this below). As I mentioned above, arbing betting is a process in which individuals take advantage of a difference in odds for a given market. Coral are offering odds of 3.0 for Chelsea to beat Man Utd at the weekend. For some reason or another, let’s say the odds Coral are offering for this market are significantly longer (higher) than any other betting company. Everyone else is offering odds around 2.5. This is a perfect opportunity for you to take advantage using arbing. By simultaneously buying and selling Chelsea to win, you can make a guaranteed profit. So in this case you would go ahead and place a back bet at Coral at odds of 3.0 and then a lay bet at odds of 2.5 at a betting exchange like Smarkets. So we know matched bettors can make a guaranteed profit using arbitrage betting if the lay odds are lower than the back odds for a given market (like our Chelsea example from above). Now we’ll look at a more common use of arbing in matched betting without such a big difference in odds. More typically, matched bettors use arbing on a daily basis to cancel out any risk from matched betting offers. Placing a back bet at a traditional bookie and a lay bet at a betting exchange is the simplest form of arbing out there. This method is called back and lay betting and it’s the main concept used in matched betting. Matched bettors place two opposite bets, one at the bookie (the back bet) and one at the betting exchange (the lay bet). This process allows you to cancel out any risk from your bets. No matter what the outcome of the event, one of these bets will win and one will lose. These two bets effectively cancel each other out. As you may or may not know, the bookies don’t hand out free bets to everyone and anyone. There is always qualifying criteria that must be completed. Bet £10, get £20 in free bets. So to access the £10 free bet you must first stake £10 of your own money. Now, the aim is to lose none of your own money in this process and that’s where back and lay betting comes in. By using the process above and cancelling out your bets, you can trigger the free bet without risking any of your hard earned cash. Once you have the free bet, repeat the same process. Only this time you’ll make a guaranteed profit as you’re using the bookies funds. Whilst this process may seem more complicated than the Chelsea example above, in essence it’s exactly the same. Looking for more information on matched betting? Check out this article. Price boosts are another example when you might use arbing in matched betting. A bookmaker may want to increase the betting activity for a certain market. One of the ways to do this is by offering a price boost. In simple terms, the bookie increase the odds of a given market to make an offer look more appealing. 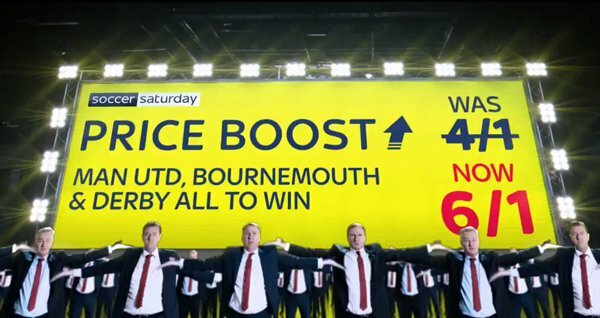 In the example above Skybet boosted the odds for Man Utd, Bournemouth and Derby all to win from 4/1 to 6/1. This ploy will undoubtedly increase the betting activity and it also gives us matched bettors a chance to profit using arbing. If the lay odds at the betting exchange remain around the original odds (before they were boosted) you can take advantage of the difference in price using arbing and make a guaranteed profit no matter what the outcome is. Price boosts can be incredibly profitable when done correctly so make sure you add them to your matched betting strategy in 2018. Check out this article for more information on how you can profit from price boosts. So far, we’ve discussed arbing using a bookie and a betting exchange (back and lay arbing). That’s because this is the most common type of arbing we use in matched betting and you can use it on pretty much any market. However, you can also make money with bookie to bookie arbing which we’ll look at next. Once again, this method takes advantage of a discrepancy in odds. Only this time it’s between two bookmakers. Typically, arbers look for events with just two outcomes, so tennis matches are perfect. Let’s say that there’s some doubt around Andy Murray’s injury before his next game. Bookmaker A prices Murray at 1.8 and his opponent 3.5. Bookmaker B prices Murray at 2.2 and his opponent at 3.0. There’s obviously a discrepancy in price here. If you act quickly and back both sides at each bookmaker you’ll be able to lock in a guaranteed profit. Stake £100 on Murray at odds of 2.2 which would return £220. Calculate the other stake by dividing the smaller odds by the larger odds (2.2/3.5 x 100). This gives us £62.86. If you stake £62.86 at odds of 3.5, the returns match the potential outcome of your first bet (£220.01). In total you’d stake £162.86 for a guaranteed return of £57.15 (£220.01 – 162.86). A very nice profit for not a lot of work! This is an incredibly profitable example and you’ll do well to find such discrepancies in today’s world of online betting. However, arbs are certainly still worth looking for and the small risk free profits soon add up. Bookies aren’t so keen on arbers, for reasons we’ll discuss later, where as betting exchanges don’t have a problem with arbing. Therefore, it’s best to use a betting exchange to place your arbs whenever possible. Odds at the bookies usually remain stable once they’ve been set. They don’t change very often. Compare this to a betting exchange where the odds are continually on the move and you can see how there are potentially more opportunities to find a potential arb to profit from. At a betting exchange you can even select your own odds, although this can be a risky practice. We suggest you don’t use this method unless you have a lot of experience with arbing and matched betting. Is arbing still a possibility in 2018? So, now you know a little more about what arbing is and how it works. Is it still possible to make a profit with arbing in 2018? Technology has had quite an impact on techniques such as arbing. It’s now easier than ever to take advantage of arbitrage betting thanks to a huge range of online bookmakers, specialist tools and software such as odds comparison sites. However, at the same time, it’s much easier for a bookie to check the odds of a competitor and alter their prices accordingly. This means the arbing world moves at an intense pace, with prices constantly changing. Overall it can sometimes be harder to find discrepancies in odds between different bookmakers. It’s not to say these price differences aren’t out there, it just means you need to spend more time looking for worthwhile markets. I recommend you use specialist software to track down these markets and act quickly once you’ve found a suitable option. What can I place arbs on? 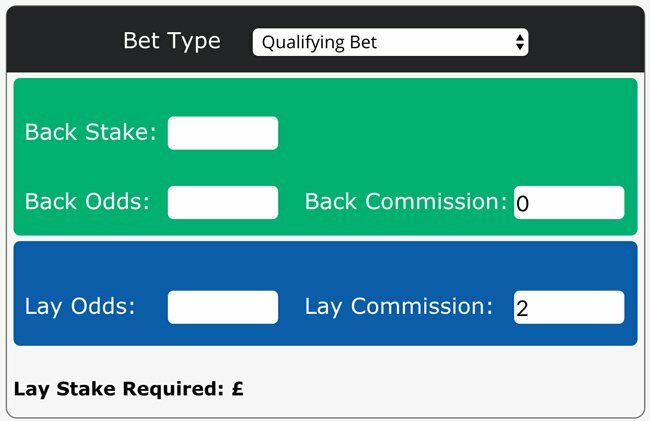 Similar to matched betting, you can place arbs on literally anything. Arbers are generally not concerned what sport they place their bets on. As long as there’s a discrepancy between the odds, you’re a winner. As I mentioned earlier, the tricky part is finding the most profitable arbs to take advantage of. You’ll usually find more arbing opportunities on horse racing and football events. Due to the speed that these markets move at, you’ll need to be quick to act and lock in a profit. I recommend you avoid placing arbs on obscure markets (markets with low betting activity) as this is a surefire way to send a red flag to the bookies, highlighting your betting patterns. Having said that, typically the larger, more popular events have very limited opportunity for arbing as the odds are fairly stable across the industry. All in all, arbing is still a possibility and some people make great money from arbing in 2018. You’ll just need to be prepared to put in the time and effort to find the best opportunities and avoid your betting accounts from being gubbed (shut down). How much can I make arbing? One of the most popular questions we often get asked revolves around how much you can make from arbing. As I mentioned above, you can literally place arbs on any market meaning there are hundreds available each day. Unfortunately, most of these arbs are low value and are arguably not worth your time completing. Having said that, there are usually one or two more profitable arbs that you can take advantage of if you’re quick off the mark. It’s important to understand that these arbs are not going to make you rich overnight. However, with consistent work and commitment your profit will soon add up. I know you’re after a number so I’d say unless you’re a professional arber like Simon Renström of RebelBetting, I think you can make up to £100 per week from this strategy. However, if you mix it in with other matched betting techniques you can easily make up to £1000 each month. What’s more, all of your winnings from betting are completely tax free which makes this technique even more worthwhile. So, we know how arbing works and how much you can expect to make. But is arbing legal in the first place? In short, yes arbing is completely legal. All arbers do is take advantage of an odds discrepancy between different betting companies. There is nothing illegal with this strategy. More to the point is what the bookies think of arbing. This is where it becomes a little murky. As I mentioned earlier, most bookies are not fans of arbing. The betting industry is built around chance and over time the bookies know the house always wins. They have an inherent edge built into the odds. Any punters that make a guaranteed profit from betting have a distinctive advantage over the bookies. Customers profiting affects their bottom line. And bookmakers do not like this! Similar to matched betting, if the bookies catch you winning too often and hurting their profitability, your accounts will likely get shut down. Matched bettors have a specific term called gubbing for this situation. There are strategies we can use to reduce the chance of this happening however, it’s still something you need to be aware of. Will you get caught arbing? So, if the bookies aren’t fans of arbing, will you get caught? In all honesty, you’re unlikely to get caught unless all you do is place arbs. The trick is to mix up your gambling patterns so the bookies don’t suspect anything in the first place. This is where mug betting becomes an important part of your matched betting strategy. If you do get caught, the bookies may restrict or gub your account in some way. As most matched bettors know, this is a complete pain which can severely affect your profitability and is best avoided. You need to keep as many accounts open and active for as long as possible to give you the greatest opportunity to complete matched betting offers and maximise your profit. Using specialist arbing software is essential to success with this technique. There are many tools out there that can help you with placing your bets and work out the required stake etc. The Sure Bettor’s matched betting calculator is an example of such software. This tool allows you to work out the exact amount you need to stake on your lay bet to ensure your bets are completely risk free. Simply enter the back stake, the back and lay odds and the commission. The arbing calculator will then work out the profit you’ll make from the bet. Our matched betting calculator is available for anyone to use so feel free to call on it as you see fit. For more information on how to use the tool, head to the calculator itself. Below are our top arbing tips that you can take away and implement in your own strategy today. Some of the most profitable arbing opportunities do not stay around for very long. It’s therefore important to take advantage of these whilst they’re available. Having your betting accounts already funded speeds up the process no end. Use specialist software. Gone are the days when you could spot an arb and casually take advantage of it. The most successful arbers now use software to help them maximise their profit. Tools like the arbing calculator are vital for success with this method. Some matched betting sites also offer the functionality of tracking all your past bets. This is something I thoroughly recommend you do. Keeping track of your bet history and which accounts are funded is crucial to success with arbing. Even a simple spreadsheet goes a long way to helping you in this regard. Whenever possible use a betting exchange to place your arb bets. Whilst bookie to bookie arbing can be worthwhile, you just increase the likelihood of getting your account shut down. Bookies are not so keen on arbing, so it’s best to avoid them wherever possible. Overall, there is more potential at a betting exchange. As with anything in matched betting, it’s vital you double check everything. This is actually one of our top 7 matched betting tips and you can understand why. Mistakes can sometimes be very costly, so it’s important to spot them before you place any bets. A small change in odds could potentially erase any profit you make. All in all is arbing worth it? Arbing is certainly one of the most popular ways to make money online. Whilst the number of arbing opportunities has certainly decreased over the last few years, there’s still plenty of profit to be made. If you’re willing to put in the effort, arbing is certainly a great way to increase your matched betting profit in 2018. 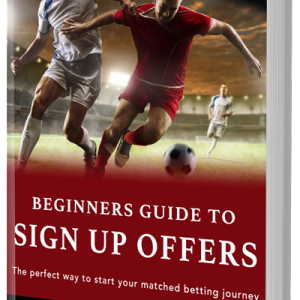 Check out this article for more information on how to get started with matched betting. What are you thoughts on arbing? Is it something you’ll be adding to your matched betting strategy in 2018? Let me know by leaving a comment below right now.